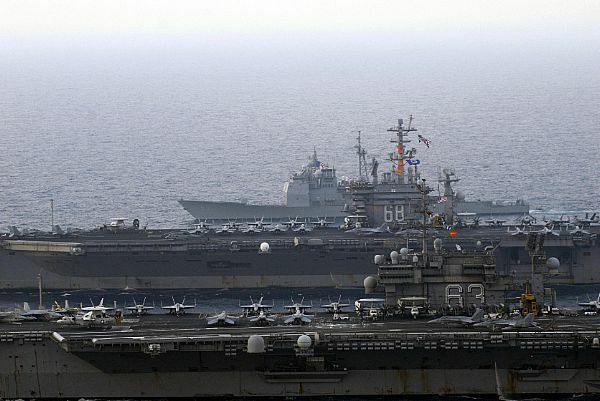 PACIFIC OCEAN (March 29, 2008) The aircraft carrier USS Kitty Hawk (CV 63), front, the nuclear powered aircraft carrier USS Nimitz (CVN 68 ) and the guided-missile cruiser USS Princeton (CG 59) steam in formation during combined training exercises in the western Pacific Ocean. 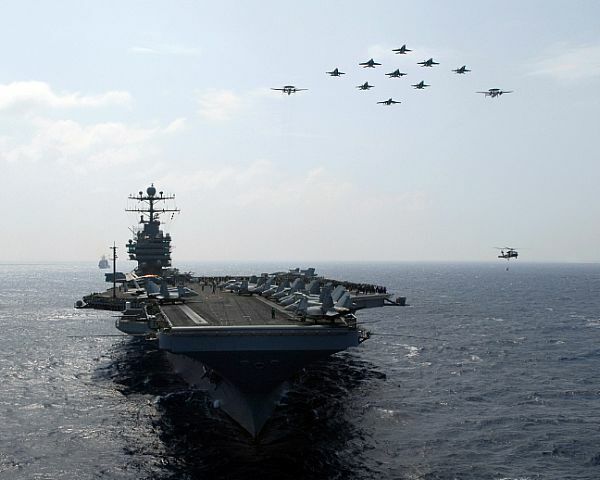 PACIFIC OCEAN (March 30, 2008) Aircraft from Carrier Air Wing (CVW) 2 fly in formation over the Nimitz-class aircraft carrier USS Abraham Lincoln (CVN 72) during an air power demonstration. 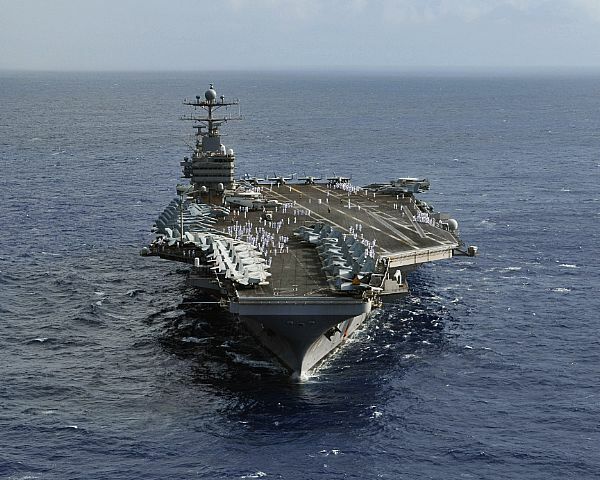 Lincoln, embarked CVW-2, and the rest of Carrier Strike Group (CSG) 9 are on a seven-month deployment to the U.S. 5th Fleet area of responsibility. ATLANTIC OCEAN (March 27, 2008) The Nimitz-class aircraft carrier USS Theodore Roosevelt (CVN 71) steams in the Atlantic Ocean. 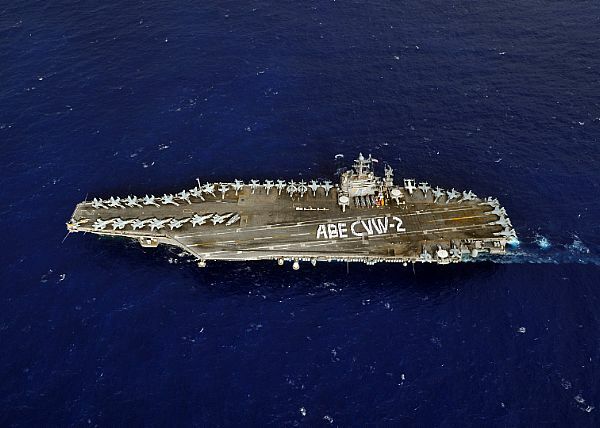 Roosevelt and embarked Carrier Air Wing (CVW) 8 are conducting a tailored ship's training availability and final evaluation problem. 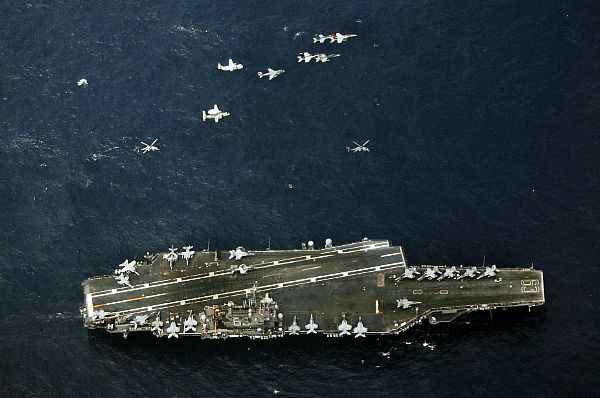 PACIFIC OCEAN (April 1, 2008) Aircraft assigned to Carrier Air Wing (CVW) 5 fly above the aircraft carrier USS Kitty Hawk (CV 63). Kitty Hawk and the embarked CVW-5 squadrons deployed in early March and will undergo several training evolutions over the next month. 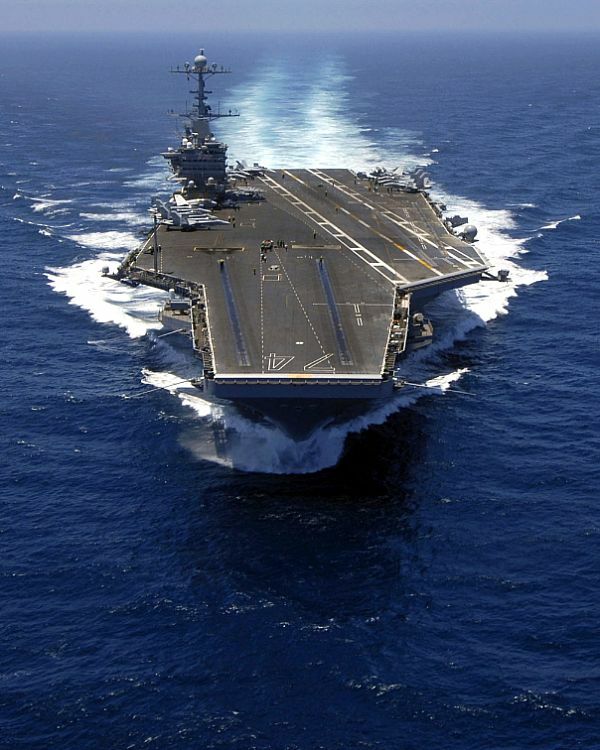 PACIFIC OCEAN (April 4, 2008) The Nimitz-class aircraft carrier USS Abraham Lincoln (CVN 72) underway at high speed in the Western Pacific Ocean. 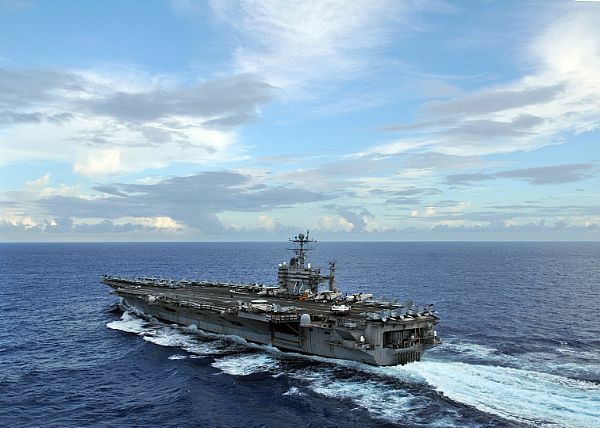 Lincoln and embarked Carrier Air Wing (CVW) Two are underway on a scheduled deployment to the 5th Fleet area of responsibility. 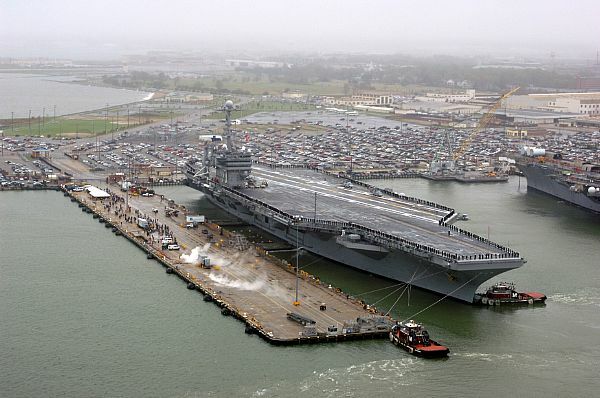 NORFOLK, Va. (April 7, 2008) USS George Washington (CVN 73) prepares to depart Naval Station Norfolk. George Washington is departing Norfolk as her homeport for the last time, and will transit to her new homeport of Yokosuka, Japan. 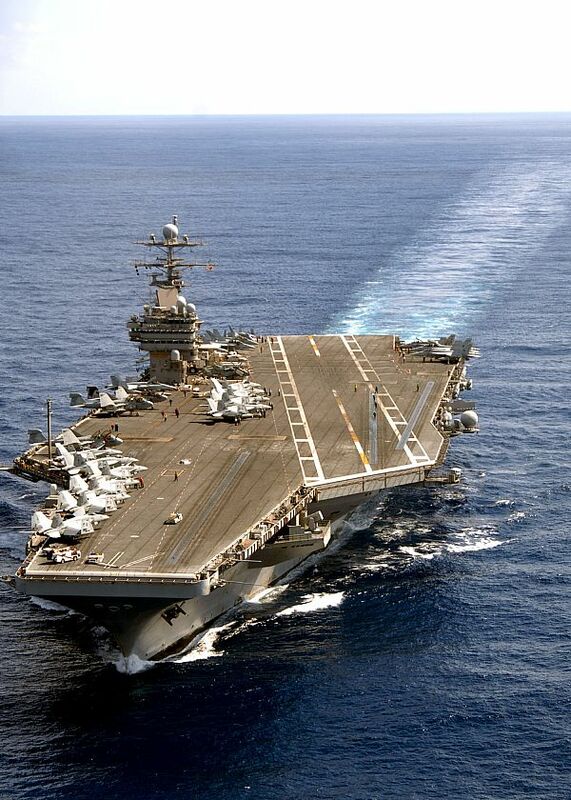 George Washington will replace USS Kitty Hawk (CV 63) as the only forward deployed aircraft-carrier. 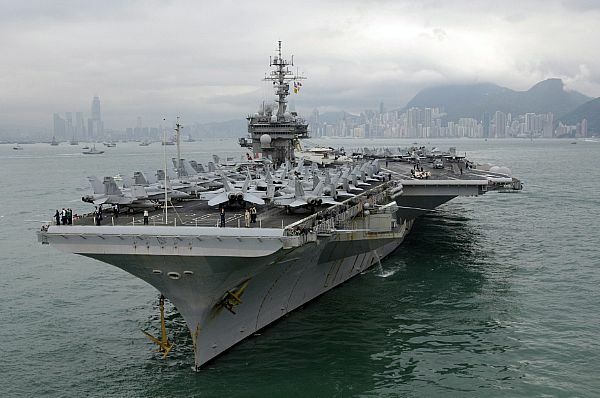 SOUTH CHINA SEA (April 28, 2008) The aircraft carrier USS Kitty Hawk (CV 63) prepares to anchor in Hong Kong's Victoria Harbor. Hong Kong is Kitty Hawk's last scheduled overseas port visit before its return to the United States later this year. PACFIC OCEAN (May 13, 2008) The Nimitz-class aircraft carrier USS John C. Stennis (CVN 74) steams through the Pacific Ocean. 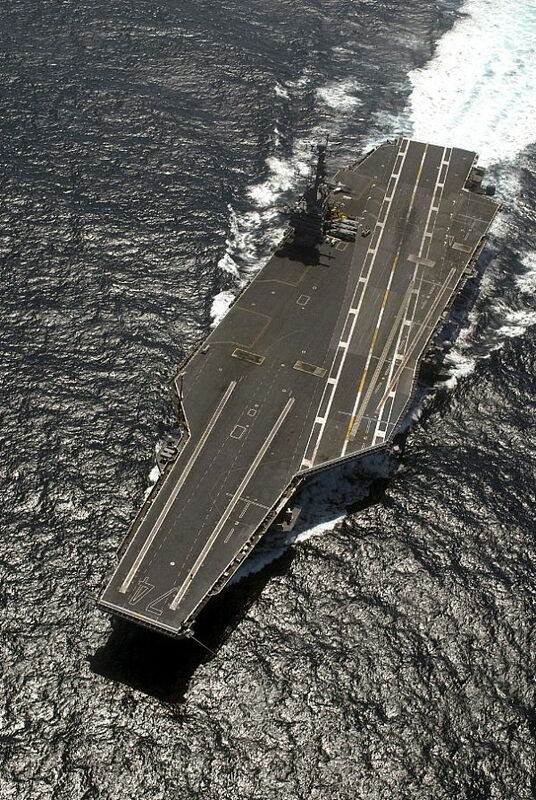 John C. Stennis and embarked Training Air Wing 1 and 2 are conducting Naval Aviation Training Command carrier qualifications off the coast of southern California. 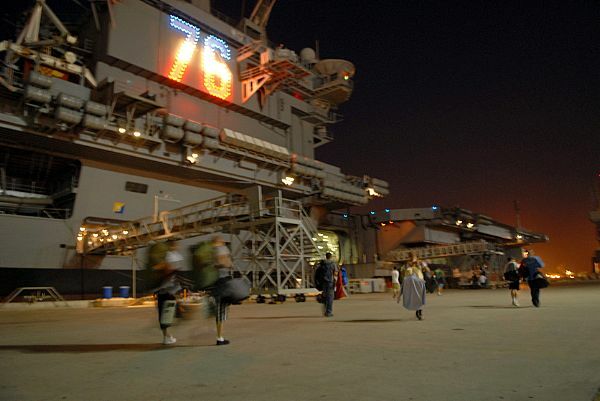 SAN DIEGO (May 19, 2008) Sailors walk across the pier towards the Nimitz-class aircraft carrier USS Ronald Reagan (CVN 76) before departing on a scheduled deployment. 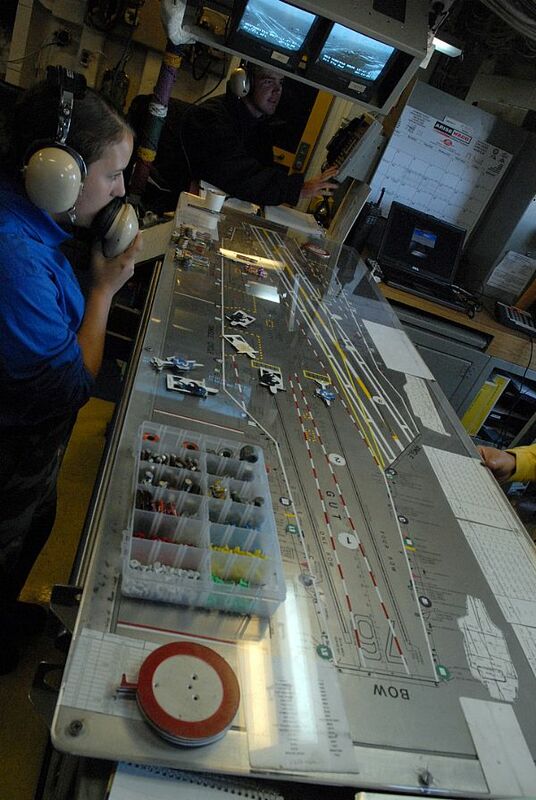 PACIFIC OCEAN (May 19, 2008) Aviation Boatswain's Mate (Handling) Airman Cynthia Willson communicates from flight deck control with flight deck personnel aboard the Nimitz-class aircraft carrier USS Ronald Reagan (CVN 76). 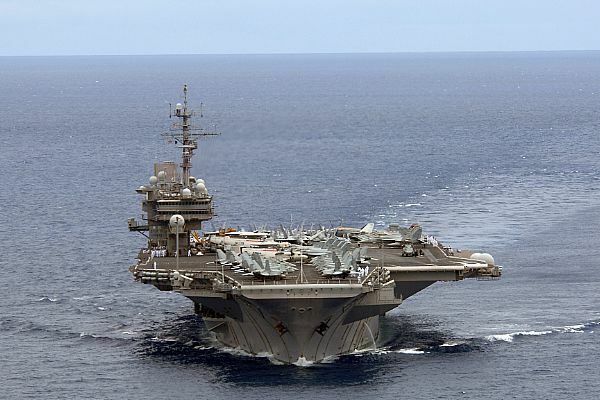 The Ronald Reagan Carrier Strike Group is on a scheduled deployment. 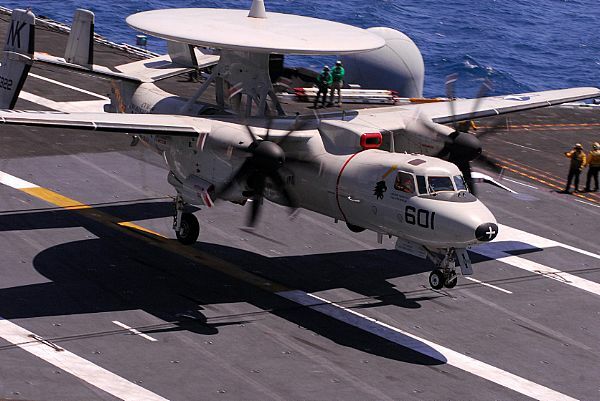 PACIFIC OCEAN (May 19, 2008) An E-2C Hawkeye assigned to the "Black Eagles" of Airborne Early Warning Squadron (VAW) 113 lands aboard the Nimitz-class aircraft carrier USS Ronald Reagan (CVN 76) at the start of the 2008 deployment for the Ronald Reagan Carrier Strike Group. PACIFIC OCEAN (May 19, 2008) The Nimitz-class aircraft carrier USS John C. Stennis (CVN 74) steams through the Pacific Ocean. 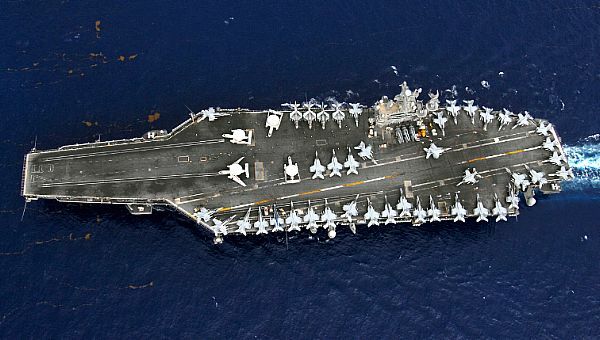 John C. Stennis and multiple embarked fleet replacement squadrons are conducting fleet replacement squadron carrier qualifications off the coast of Southern California. ATLANTIC OCEAN (May 31, 2008) The aircraft carrier USS Harry S. Truman (CVN 75) transits through the Atlantic Ocean as it and embarked Carrier Air Wing (CVW) 3 prepare to return to home port after a seven-month deployment in the Persian Gulf. PEARL HARBOR, Hawaii (June 24, 2008) The aircraft carrier USS Kitty Hawk (CV 63) arrives in Pearl Harbor prior to the start of exercise Rim of the Pacific (RIMPAC) 2008. RIMPAC is the world's largest multinational exercise and is scheduled biennially by the U.S. Pacific Fleet. Participants include the United States, Australia, Canada, Chile, Japan, the Netherlands, Peru, Republic of Korea, Singapore, and the United Kingdom. PACIFIC OCEAN (Sept. 27, 2008) The Abraham Lincoln Strike Group is on a scheduled deployment in the U.S. 7th Fleet area of responsibility operating in the western Pacific and Indian oceans. 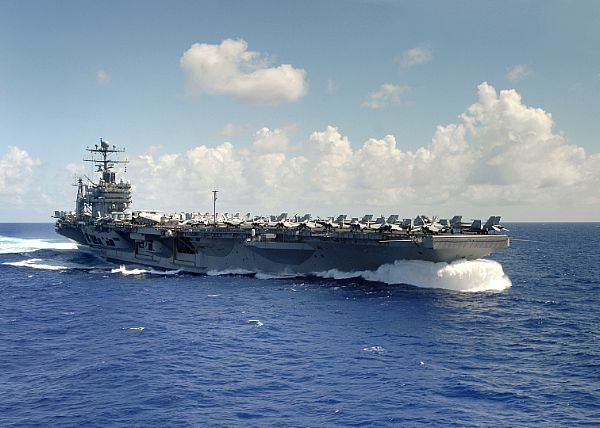 The aircraft carrier USS Abraham Lincoln (CVN 72) is underway during a transit of the Pacific Ocean. Sailors assigned to the aircraft carrier USS Abraham Lincoln (CVN 72) and Carrier Air Wing (CVW) 2 participate in a "flight deck spell out" aboard Lincoln while transiting the Pacific Ocean. 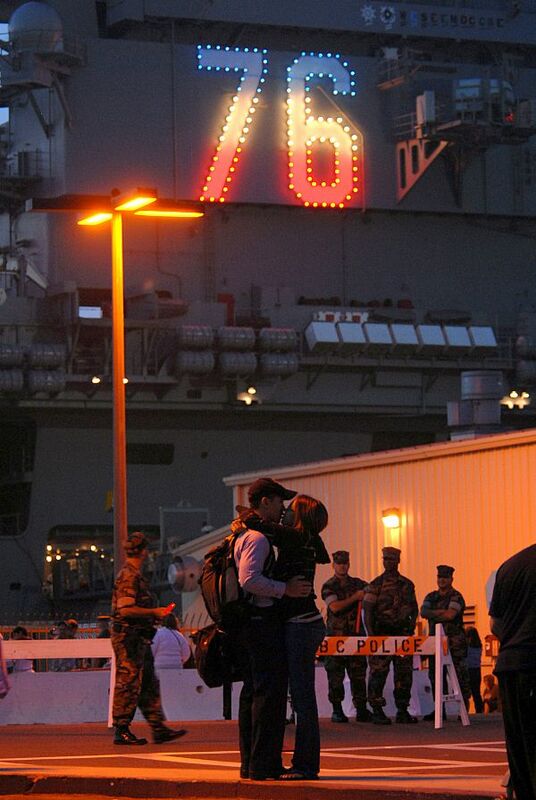 The aircraft carrier USS Abraham Lincoln (CVN 72) is underway as evening falls during a transit of the Pacific Ocean.